1. I finally wrapped up Friday Night Lights so the obvious next step was to dive into something else immediately. The Princess and I have started watching Gilmore Girls. Given how she ridiculed me when I turned the first episode on, I find it amusing that she’s so engrossed. 2. Coming home to nice mail is a fun change of pace. 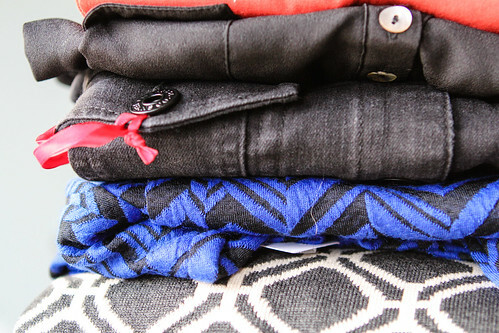 Yesterday was StitchFix day. Unfortunately, I don’t necessarily have the budget to buy a bunch of clothes so fortunately there were some fit problems: I am far too long waisted for the blue dress, the denim jacket had a fit I didn’t love, and the orange top – though I loved the color – just wasn’t worth the $54 price tag to me. I’m keeping that funky cardigan on the bottom – when I pulled it out of the box, I was sure it was a sofa pillow but it’s funky and warm and will probably be ideal in the super cold Michigan months we’re about to dive into. 3. A client visit yesterday meant that I was on the road by 6:30. In the morning. While I’m usually awake then, I’m not usually up, ready and out the door then. And then there were no convenient coffee shops on the way. And then everything was awful. Actually, it wasn’t that awful, just early mornings with PMS and no coffee don’t really bode well for my general demeanor. Sorry. 4. I finished antibiotics for a sinus infection a few weeks ago and well… I think the damn thing is back. That’s probably not really helping my mood either. This morning I woke up feeling like wet cement was poured near my sinuses and then hardening and expanding and blowing up my sinuses. Pretty picture, huh? 5. I have been on a reading frenzy lately. I went to the library a few weeks ago – picked up six books. While there, I told myself I wasn’t going to berate my choice in books and if I want to read even if they’re not rocket science. The result? I have entertaining speedy reads to pick up after a long day. It’s been nice to want to read again. 6. I actually bought Halloween candy to pass out this year instead of turning my lights out and pretending I’m not home. Actually, last year I wasn’t home – but that’s neither here nor there – usually, I avoid it like the plague – and this year I HAVE CANDY. 7. But I’m hoping no one comes so I’ll have enough candy left over to make the Leftover Halloween Candy Vanilla Bundt Cake I make every year. 8. I have no concrete plans this weekend but to get my shutters back on my house and I’m relieved and hopeful for a moment or two to breathe. Feels like life has very much been gogogogogogogogogogogo lately and I just want to stop moving and catch my breath. I want to not have to do anything or be anywhere at least for a little while. 9. I’d also like to sleep in and not be on the road at 6:30 a.m. Last weekend, i didn’t have anywhere to go and yet I was up just after 6. Ridiculous. Body clocks are absolutely ridiculous. 10. Isn’t it nice that I’m not talking about elections?